by Eugen Rosenstock-Huessy. In 3 volumes, hardbound, about 1050 pages. Talheimer Verlag, Mossingen-Talheim, Germany. Planned release 1997. 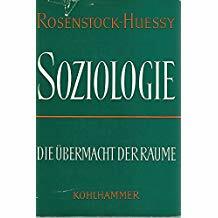 Soziologie is one of Rosenstock-Huessy’s fundamental works. It is not available in English, although some of the material forms the basis for the lecture series Cross of Reality (1953), the Circulation of Thought group, and the Universal History group. Soziologie is written around the spaces and times which govern human life, language and associations. To Rosenstock-Huessy, speech is central to sociology; sociology must recognize that speech is the concrete form of social reality. In Volume 1, Rosenstock-Huessy presents the areas of existence in which people play or confront serious life, such as marriage or service in war. He says that important human experiences like these are created by human powers like enthusiasm, love, or faith. He then contrasts these life-changing, deeply rooted experiences in time and space with the abstract concepts, space and time. He sees these human powers as the concrete forces which create timespans, and so create and structure history. In Volume 2 he turns to history, which he sees as one part of each person’s soul, and so a major influence on people’s actions. He presents recurring historical events and times both as people’s personal experiences and as constituent parts of a larger whole. In Volume 3 he turns to questions of people living together, and discusses the way they create communities and social structures. Until now, this book has been flowering in secret, although these volumes entitled Our Obsession with Spaces (Die Übermacht der Räume), The Full Count of Times 1 (Die Vollzahl der Zeiten), and The Full Count of Times 2 have made a lasting impression on the scattered community of their readers.